I think that Doctors must be wired differently than me. No, not because they can perform crazy-hard surgeries that save lives...I'd like to think that if I devoted a decade to learning how to do that, I could be a pretty good doctor myself. No, it's the SLEEPING...or lack thereof. How do they do it?? 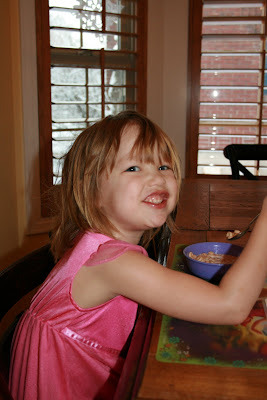 I have been sleep-deprived with each of my three kids. And with each one, I don't get more used to it. Instead I get more delirious. You know those people who claim that they were sleeping when they committed a murder. And you think "Is that the best story you can come up with?" Well, that could be me! Truly. I am so tired lately, that when morning comes, I have no recollection of the night. Was the baby up during the night? I don't know. Did the cat need to be let in? I don't know. Did Shelby wake up with leg aches? I don't remember. Did you murder our neighbor? Haven't the foggiest. My wake-up lately has been of the violent sort. I will be perched on the outer-most rim of our bed. Conscious at some level that I can not move a hair, or I will fall off the bed. But somehow I manage to sleep in this acrobatic position. Then, with out any warning: WHACK! Right across the face. Usually twice in a row before I bolt up and grab the blunt instrument away from the attacker, who happens to be Garrett, sandwiched happily between Gavin and I, with his half-full bottle in hand, wide awake now that it's all of 6 a.m., and ready to play. Gavin has his force-field up in place, which is his enormous back that he has towards me and the baby. The man can not sleep in any position other than on his side. And like his 6th sense, when the baby finds his way in to our bed at night, Gavin switches sides, rolls over, and has a big giant back to protect him from all bottle whackings that may occur later. It's actually OK with me, because his back acts as a big baby-gate, so at least I know that Garrett isn't going to go falling to his death off that side of the bed. So, after I've rubbed my seemingly broken-nose, with one hand, whilst holding Garrett with the other so he doesn't launch himself off my side of the bed, I pick him up and set him on the floor where he pops up on to his feet and walks straight in to my bathroom to stick his hands in my toilet. I have about three seconds to try to recall if Gavin or I used the bathroom in the middle of the night, and if so would A) the toilet have gotten flushed and B) would the lid have gotten closed? The odds aren't great. So, I then bolt out of bed in time to see Garrett bobbing his little hand in to the toilet bowl. I stagger to get him. Walk him to his bedroom, where I change his twelve pound diaper (thank goodness we splurge and buy the super-absorbent brand). The only way I accomplish this feat, is by having a stash of breakable and off-limit items in his dresser that I pull out just before he arches his body and attempts to catapult himself off his changing table. I have to make sounds like "Oooh...ohhhh (translation: you are not supposed to play with those! )", whilst pretending to pull said breakables out of his pudgy little death grip- Amazingly at the age of ten months, he already gets this, which makes him cease mid-way through his vault and try to eat the ceramic gecko, hemorrhoid cream tube, or someones ?? old toothbrush. Once we have accomplished the diaper change, we stumble in to the front room, passing the stairs where I kick the baby gate to make sure that it is securely closed. Garrett is on the floor, roaming from room to room, picking up whatever treasures the big kids have accidentally left for him. Like a cat, with fresh kill, he walks back to me, his cheeks bursting with some Playmobile figure, or Baukugan ball. His little white teeth, replaced with brightly colored plastic. I swipe my finger through his mouth, causing the booty to come spilling out. He is frustrated, but then is quickly off to find another treasure. Minutes pass, and then Dalton is awake and laying next to me on the couch. He grabs the remote and finds some DVR'd show like Pokemon to watch, "claiming" he's done all of his morning chores already. 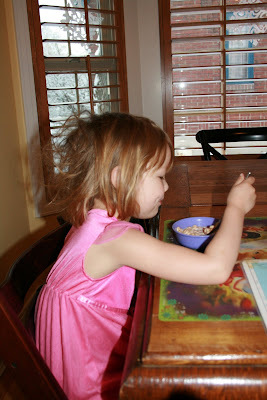 After we are halfway through Pokemon, sis comes in, with some sweet bed head. "Yeah, it's Sissy!" We all say. I motion for her to come give me a snuggle, and she climbs in to the couch, pulling blankets on to herself as she nuzzles in between Dalton and I. Garrett, at this point, wants in on the action, and motions to be picked up and held. Dalton and Shelby coo at his fat, happy little face, as he smiles- his eyes disappearing in to his head and his smile spreading across every inch of his face. Then breakfast served, and lunch made for D. I think that it's God's gift to me, the days he looks on the school's lunch menu and exclaims he wants to eat it, because it's pizza (about the only thing he thinks is edible). Next, is baby's breakfast. At this point Garrett is out-eating Shelby. 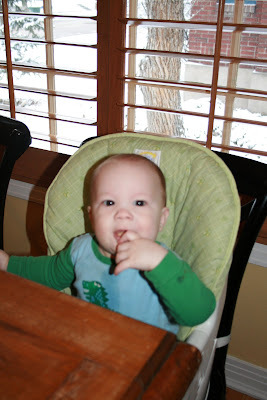 Once he is in his high chair, he is yelling for food. Organic chicken sausages, Lima beans, applesauce, blueberries, sweet potato. He will only eat it if he can pick it up HIMSELF. If I put it in his mouth, he spits it back out in his hand. Studies it while he plays with it in his fingers. Once it has passed the texture and eyeball test, he THEN will put it in his own mouth. Some times I long for the day when my kids and I will all eat the same meal, with utensils, at the same time, with NONE of it ending up on the floor or being wiped from their faces and/or clothing afterwards. Shelby eats with us at the table. Then it is a hosing down of Garrett, and on to get him dressed in his first ensemble of the day. After about another hour, he is ready to go down for his morning nap. This is where I have been a softy. I have been loving rocking him to sleep. I think partly because I get to partially dose off in the rocker with him. Here's the problem. I knew I was creating a monster with this one. And it's happened. Now, every time he hears someone walk by in our CREAKIEST-HALL-IN-THE-BLASTED-WORLD, his little radar ears perk up and he jumps up, crying to be, you guessed it, rocked back to sleep AGAIN. At first, I was eager. YEAH, Another break in the rocker with my babe. But soon it turned in to several times during his nap, then several times at night. And that brings me back to last night. What happened in the middle of the night??? Who knows. How did the baby end up in our bed??? No recollection. I plead the 5th. So, enough already. After two kids, I know enough to know that when a baby wakes up crying, if there is nothing else wrong with said baby, he is still tired. A baby who wakes up happy is well rested. And lately, I am not sure who is crying more when the baby wakes up, me or said baby. So, to prevent any sleep-induced homicides, I have to make a plan. No more getting baby out of bed in the middle of the night. I will check on him, but if he is OK, then he is going to be putting himself back to sleep. No more rocking to sleep. Sad, I know. I will still rock him before his naps and before bedtime, but I am going to put him in his crib awake (IE: him crying while giving me the look that says "You are the cruelest mother in the world, and I will need therapy for this some day"). Today was day one. He woke up twice already during his nap. Both times, he was able (after 15 minutes of crying) to go back to sleep. So good, so far. But it's the night that I DREAD. It could be scary...but really, I don't have the genes/patience/metal-stability to be continuously sleep-deprived and function at a normal level. So, good thing I am not your brain surgeon. I just have to be able to put together a pb&j lunch for Dalton, keep the other kids alive, get Shelby off to school-hopefully with her hair combed, and pray that I get my own teeth/hair brushed at some point. I know that doesn't sound like brain-surgery. But with inadequate sleep, that's exactly what it feels like to me. So, wish me luck with my plan (is this my tenth one with this kid??) I am off to take a nap. I started sleep training my daughter Hannah when she was 4 months old. She could win a gold metal in the sleeping. My son (now 9 months old) was the most colicky baby ever born. EVER. I was quite skeptical of this program, thinking there was no way this book could help me sleep train my screaming nightmare baby. After he had grown out of most of his colic, we started sleep training. He was about 6 months old. He sleeps like a champ. He could challenge Hannah for that gold metal in sleeping. This book does not believe in the cry it out method. It will change your life, and bring sanity back. You'll get your bed back and you'll have more hours of the day to busy! Trust me on this . . . you'll thank me when you suddenly have the hours of 7 PM to 7 AM all to yourself. I thought my kid was dead the first night I didn't hear him for 12 hours.